IRVINE, Calif., Jan. 12, 2015 /PRNewswire/ -- Momentum CRM, a leading provider of software-as-a-service ("SaaS") enterprise relationship-management solutions for franchised and independent auto dealerships, announced today its integration with AutoAlert, Inc., North America's premier data mining, lead generation, and sales opportunity provider. 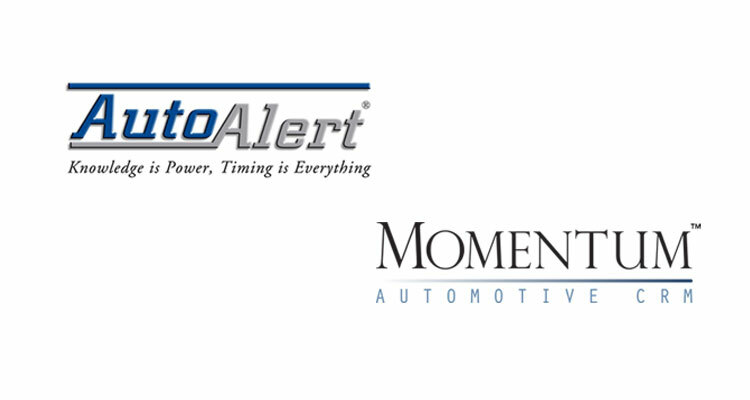 This real-time, bidirectional integration embeds AutoAlert functionality directly into and all throughout the Momentum CRM, giving users access to either system via single login. It also eliminates redundant data entry. Tools and information, including customer and vehicle data, assigned "Alerts", and work notes, entered into one system are automatically available in the other. This integration gives users total transparency into all activities for all customers, providing them the flexibility and choice to work in either system, at any point. "This integration will further benefit our shared customers by bringing AutoAlert's best-in-class product into our Momentum CRM," said Roger Niederland, Owner & Co-Founder of Momentum. "Through this integration we've further simplified how our dealers will communicate with, sell to, follow up with, and retain their customers' business." Using AutoAlert, dealerships have consistently increased monthly vehicle sales by up to 20 percent or more. This integration with the Momentum CRM now makes this process even more efficient and successful. AutoAlert is the automotive industry's leading data-mining and lead generation platform helping dealerships identify high-quality leads, increase volume of retail trade-ins, and improve customer retention. Founded in 2002, AutoAlert has provided the automotive industry with innovative software, marketing and training solutions. For more information, contact Nathan Warner, Director of Marketing at 949-398-7008 or Nathan@autoalert.com or visit www.autoalert.com.